My grandfather William James Harper married a widow Annie Maria Smith nee Fraser. Annie Maria had 2 girls and a son who later died in a drowning accident at Riddells Creek. Annie Maria was born to Charles Fraser and Maria Lush at Elphingstone near Tarradale in Victoria in 1863. She was 12 years older than William when she married him in the Registry office 442 Queens St Melbourne on the 19th January 1900. Nothing much is known about William. Judging by what Annie Maria stated in the Gisborne court he deserted her just after Ira Charles Norman was born and went to live in Tasmania. A 1907 newspaper article reported on a court case involving William Harper, described as a hairdresser and tobacconist being arrested for desertion and failure to pay maintenance. In Annie’s words she suffered six years of abuse before William walked out of home one day and did not return. In the court they argued back and forth about maintenance. William had sent a small amount of money to her during the time he was away and told her he had accommodation for her and the children and asked her to join him. She refused. The court ruled that he had not deserted her. As she did not want to go and live with him in Tasmania he got off the hook. William gave him another name but soon realized the game was up and admitted to the police officer that he was the person on the warrants. The warrants were for desertion and theft of a pair of hair clippers. The case of theft was dismissed as the claimant could only identify them by the fact that the last mans hair he cut was grey and there was grey hair on the clippers, not real good evidence for a conviction. It did not end there as Prison Records at the Melbourne Gaol record on page 90 Entry 31619 show WILLIAM ERNEST Harper was sentenced to pay 5/- a week and find one surety in 25 Pound in default imprisonment indefinately on 23 Jan 1908. On the 11 Jul 1908 he was given his freedom on Special authority 1908/C5094. Dad (Norman Harper) always told us he had a half brother that drowned at Riddells Creek but never elaborated on it as it happened before he was born. He always lived in fear of us kids drowning. He would not let us go into water until 1 hour after eating. He seemed to believe if you went into water with a full stomach it could be the end of you. Most of us kids built up a fear of water because of him and were never very good swimmers. In fact I would say I have a fear of deep water. An article that appeared in The Sunbury Times dated Saturday 8 Jan 1903 has solved the mystery, it reads as follows. Riddells Creek –On Christmas evening, Leslie James Smith a lad of eleven years of age, and the stepson of Mr W Harper of Riddells Creek, went fishing in the creek near the bridge. He had not been gone long when * Mr Smith went in search of him and found the body in the creek in a depth of about 2 feet 6 inches of water. The fishing line was twisted around the hands of the deceased and there was an eel on the hook. The body was quite warm when found, so that life could not have been long extinct. As the creek was so shallow at that point, it is supposed that death was due to shock. NOTE: * Mr Smith is a mistake – it probably should read Mr Harper. It has been established through research and confirmed from records and The Southern Cross Scots by John.E.Price a record of the Boer War that William did indeed join the Marquis of Tallibardine’s Scottish Horses. 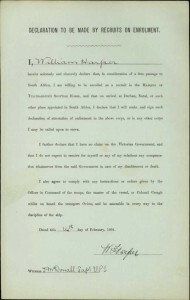 He signed on as trooper on 14th February 1901 and departed Australia on March 15 1901 aboard the S.S.Orient. On board the ship was a contingent of 1000 Victorian regular soldiers. and 250 Scottish horse volunteers. William Harper 31632 had enlisted for a “free ticket” to the Cape Colony and 5 shillings a day when he got there. William Ernest Harper who sometimes bent the truth, signed on as an engineer. Volunteers had to be of Scottish descent (William was Irish), Single (he was married) be a good horseman, a good shot with a rifle and under 13 stone (83Kg). Trooper WE Harper 31632 CC/OFS/T/ 01 (Transcribed reads Cape Colony/Orange Free State/ Queens South African Medal with Clasp 1901) Departed Sth Africa for Australia on 14 Sept 1901. Seeing that uncle Eric was born on 19 Nov 1901 he must have just made it home for the event. Early February 2012 while researching on Ancestry.com a link popped up that led us to a Wilfred Eric Harper. Further investigation took us to Roots online where we found others searching for Wilfred Eric Harper. (aka William James/William/William Ernest/Wilfred Eric Harper).. We always had strong suspicions that this man, whose name seemed to pop up repeatedly ran very close to what we were able to establish was our man. There were too many similarities and co-incidences for it not to be William James Harper. Previous searches of the electoral rolls show William living in North Melbourne in 1914 and his occupation also as hairdresser. When George Eric (Eric) tried to join the army in 1917 his papers state his father as being deceased. Our parent’s marriage certificate in 1927 it also declared William as being deceased. We now know and can confirm that apart from the Boer War William also served in the AIF during WW1 as a Trooper in the Australian Remounts Unit 1 Squadron 3 stationed at Netta Bend near Murray Bridge in South Australia. Enlisting on 27 Sept 1915 he departed on the transport A67 Orsova on 12 Nov 1915. The Squadron took horses to the troops in the Middle East and was combined with the 2nd Remounts shortly after arrival. The Squadron was mainly made up of men who were over 40 years of age and had missed out due to some small ailment preventing them from being ground troops. William stated he was 46 years of age when he was in fact 40 years of age. He had altered his age again and used Wilfred Ernest to fit the circumstances. He stated his wife was Mrs May Harper living at Netta Bend via Murray Bridge in South Australia. He served 264 days before returning to Australia on Apr 20 1916. ( Ref The AIF Project, UNSW @ ADFA). His service entitled him to serviceman’s Soldier Settlement Block in Red Cliffs (near Mildura) Victoria on his return. William’s Service medals which were struck after the war ended were sent to his enlistment address at Netta Bend Via Murray Bridge South Australia on 3 March 1924. They were the Victory Medal # 7044, British War Medal # 7067, and the 1914/15 Star # 7406. As he no longer lived at this address they were returned unclaimed to the army. The army apparently unaware of William’s maritial status forward them onto Annie Maria on 19 Jan 1925 via Registered Post #2381 at 10 Austin Street Footscray. What became of his medals is not known. We now know that William died as Wilfred Eric Harper at Mildura Victoria on 24 Dec 1921 of stomach cancer. It appears he had been co-habitating with a Rachael May Johnston for at least 10 year in which they produced 8 children. William had served 264 days with A.I.F during WW1. On return from the war William was allocated a soldier settlement block at Redcliffs. When he died his partner with 8 children under 10 had no choice but to put it up for sale. Not being his legal wife, under the law she could not dispose of his assets and was left basically destitute. She moved to Ballarat and obtained a position as a cook at the Ballarat Orphanage in Victoria St Ballarat East which provided accommodation for her children. She stayed in this position until her children had all grown up. She later worked as a cook for Sir Henry Bolte (Premier of Victoria) and his shearers on his property at Meredith. There is no evidence of them ever marrying. She was often called Jean by her friends. I feel William moved around a lot to cover his tracks and avoid his responsibilities to Annie. One interesting fact was A.B. ( Banjo) Patterson who was trying to get to the war as a correspondent had been given a the rank of Captain and sailed on the ship with these men, he later went on to command the battalion in the Middle East as their Major until 1918. He is reputed to have given them the name of “Methuillier’s Remounts” in keeping with the average age of the squadron. Hi there, as Leslie Rex Joseph Harpers (son of William aka Wilfred Harper) granddaughter, i would love to know more about him as my mother Karen Elizabeth Harper born 1952 is not listed as his daughter at all, nor is eldest sibling Rex Harper of Boundary Bend. Your website has been very helpful, insightful and enjoyable. Thank for all your work. If you contact me, I may be able to provide you with some information about your grandfather.